Rodeo season is in full swing along the Front Range, just as it has been for over one hundred years. From bull riding, calf roping and goat tying to parades and pancake breakfasts, the Front Range has featured these competitions and celebrations each summer. 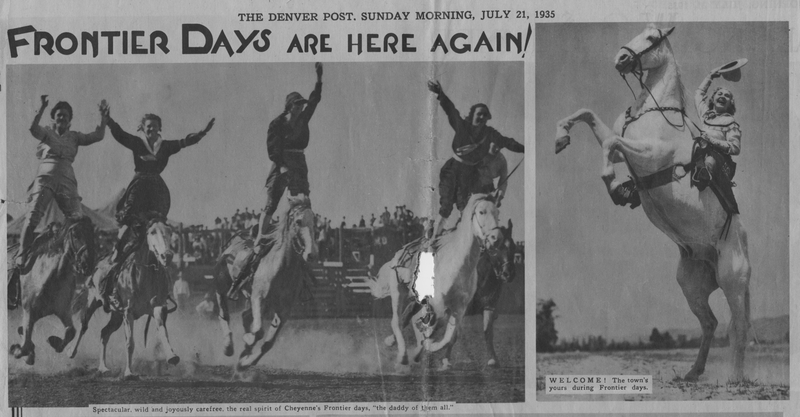 Fort Collins hosted many rodeos over the years. Colorado State University held College Days each spring between 1910 and 1987 to celebrate school spirit. Starting in the 1920s the celebration included a rodeo called the Skyline Stampede. This rodeo is still held each spring and is the oldest running collegiate rodeo in the country. The following photograph is from the Skyline Stampede in 1938. Additionally, the university’s Rodeo Club has been a mainstay among extracurricular activities. 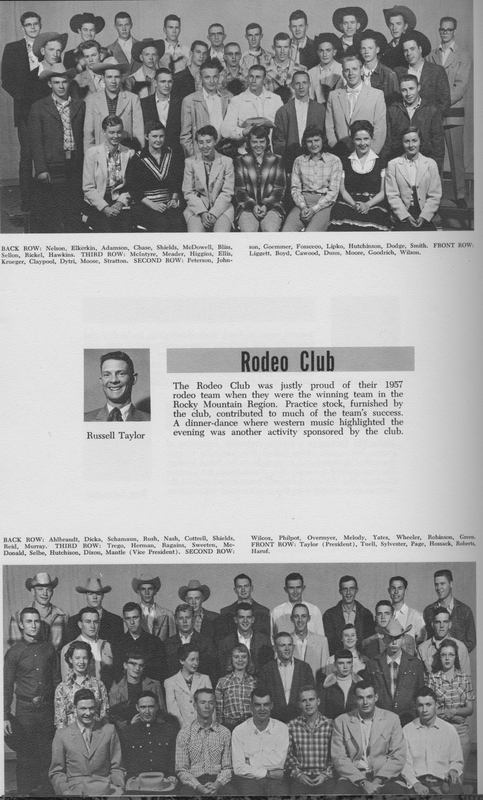 This image shows the Rodeo Club’s page in the 1958 edition of Silver Spruce, the university’s yearbook. Another Fort Collins rodeo was the Round-Up. 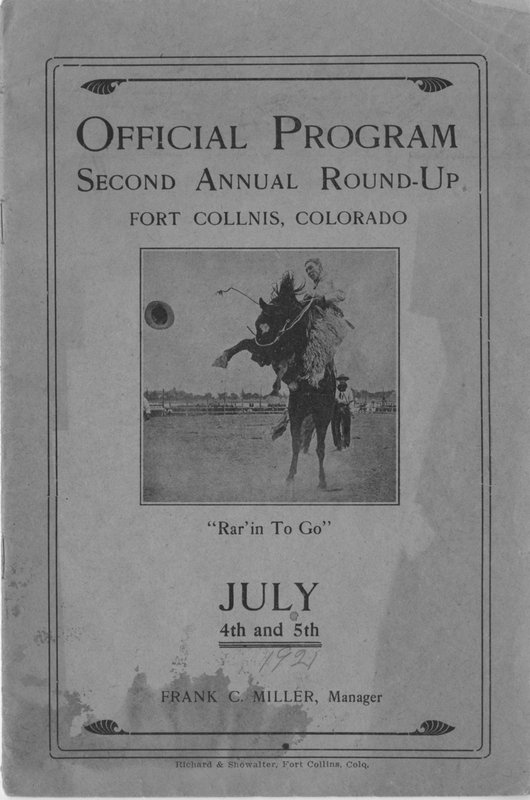 A program in the Local History Archive outlines all of the events at the July 4-5, 1921 Second Annual Round-Up hosted by Frank Miller. For contestants and spectators “Rar’in To Go,” this rodeo hosted over twenty-two events and a parade, drawing local and national rodeo competitors. 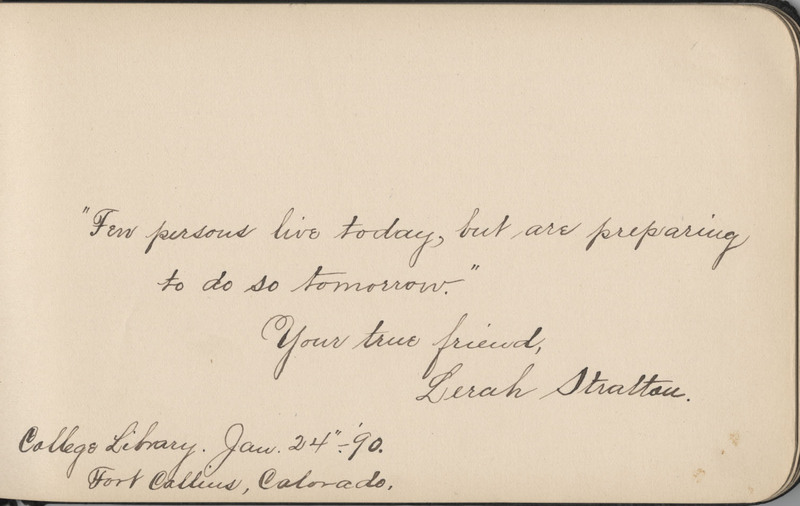 Some events included calf roping with a $200 purse, the ladies’ cow pony race with a $50 purse and an exhibition of fancy shooting by Frank C. Miller and Capt. 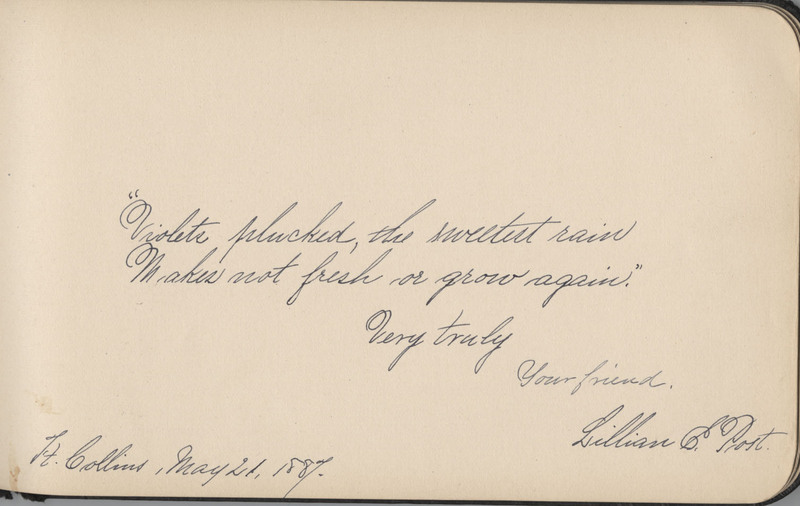 A.H. Hardy. The program also tells about a play, written by Courtney Ryley Cooper, which was slated to be filmed at the Round-Up. It was to be released under the title White Riders of the Range, although no evidence of the film’s completion exists. Here is the front cover of the 1921 program. Every summer since 1897, Cheyenne, Wyoming has held a rodeo that is currently the largest outdoor rodeo. For this reason it has gained the nickname, “The Daddy of ‘em All.” This rodeo is known for its Professional Rodeo Cowboy Association (PRCA) rodeos, headline concerts, pancake breakfasts, United State Air Force Thunderbirds show, Indian Village, and carnival. These photographs were printed in The Denver Post in 1935. While the Greeley Stampede, the Rooftop Rodeo in Estes Park, and Laramie Jubilee Days Rodeo have already passed this summer, if you are “Rar’in To Go,” there are still many upcoming rodeos. These include “The Daddy of ‘em All” Cheyenne Frontier Days, Cheyenne, WY, July 20- August 1; Little Britches Rodeo, Pueblo, July 23-31; Boulder County Fair, Longmont, August 6; Larimer County Fair, Loveland, August 8-10; Logan County Fair, Sterling, August 3-6; and Senior Pro Rodeo, Estes Park August 20-21; Sundance Bull Riding, Fort Collins, weekends in August. Tags: chickens came first, What came first the chicken or the egg? In “breaking” news, it seems that one of the oldest riddles, “What came first, the chicken or the egg?” may have been solved. The verdict? The chicken may have won by a nose (or a beak). Published in the paper “Structural Control of Crystal Nuclei by Eggshell Protein” (put that on your summer reading list) in the journal Angewandte Chemie, researchers Colin Freeman and John Harding of the University of Sheffield and David Quigley and P. Mark Rodger of the University of Warwick argue that the chicken came first. Sort of. What the researchers found was that a protein, ovocledidin-17 (OC-17), produced in the chicken’s ovaries and present in the hard part of a chicken’s eggshell, plays an important role in speeding up the production of eggshell within the chicken’s body. When the protein is absent, an eggshell cannot be produced and without a hard, protective eggshell, a fertilized chicken embryo cannot survive. No chicken producing OC-17? No chicken egg. However, whether or not this new evidence solves the famous riddle is up to both debate and semantics. If you interpret the riddle to mean, “What came first, the chicken or the concept of an egg as an encased, fertilized embryo that can develop on land outside of the mother,” then the answer is “the egg.” Reptiles, the ancestors of all birds, were laying eggs long before chickens evolved. However, if the riddle comes down to chicken versus chicken egg, the research on OC-17 may tip the scale a little more in the chicken’s favor. This past week, approximately 150 people in Rye, New Hampshire were stung by the a 40lb Lion’s mane jellyfish (or “jelly,” which is the more appropriate zoological term) that washed up on shore. Lion’s mane jellies are the largest jelly species in the world, and the largest individual ever recorded was over 7 feet in diameter and had tentacles of 120 feet long. The individual who showed up in Rye was described as being the size of a trash can lid and when officials removed it from the water, some of its many tentacles broke off and continued to sting people who came into contact with them in the ocean (tentacles can remain “alive” for 3-4 days after a jelly dies). Living in lovely, landlocked Colorado, you might think that jellies are one thing you don’t have to worry about encountering, but you’d be surprised. Meet Craspedacusta sowerbyi. C. sowerbyi is a freshwater jelly found throughout the world. Here in Colorado, C. sowerbyi has been found in lakes and reservoirs in Jefferson and Boulder County, and its range is likely to keep expanding. Jellies all belong to the phyllum Cnidaria (organisms that have cnidocytes – specialized cells used to capturing prey) , but there are several different classes including the Scyphozoa (the “true” jellies like the Lion’s mane), Stauroza, Cubozoa and Hydrozoa (the class C. sowerbyi belongs to). The Hydrozoa jellies differ from the true jellies by having a muscular, shelf-like structure called velum on the ventral side of the jelly that helps with propulsion through the water. C. sowerbyi is small, only 20-25mm in diameter, but in that small space it has up to 400 tentacles, with each tentacle having thousands of cnidocytes, and each cnidocyte containing nematocysts used to sting and capture the tiny zooplankton it eats. The nematocysts inject poison into any prey they come in contact with, but don’t worry – C. sowerbyi’s nematocysts are too small to penetrate human skin. 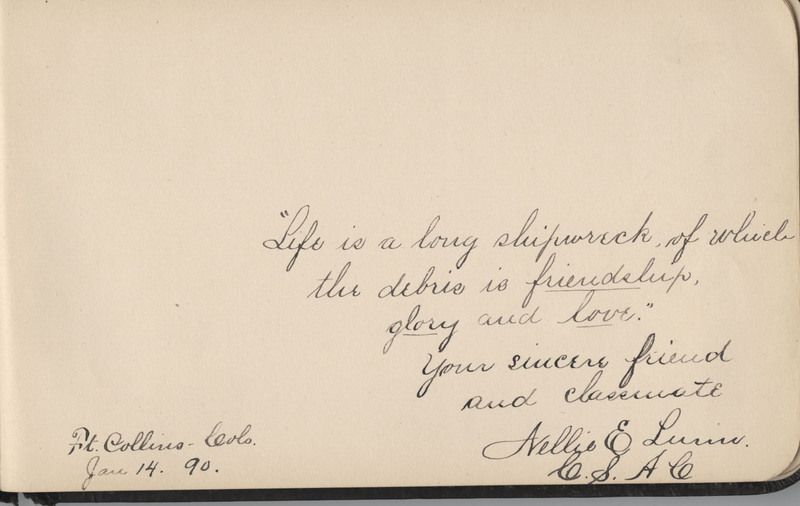 Like all jellies, C. sowerbyi doesn’t always look like the image above. Jellies are dimorphic (having two shapes) and the organisms begin their life as a stalked, sessile polyp and then bud into a swimming medusa (the stage that looks like the jellies we’re all familiar with). For all jellies, the medusa stage is when sexual reproduction happens, with the resulting larva settling on the substrate and turning into a polyp. For C. sowerbyi, the most common form of reproduction is asexual, where the polyps bud off into more polyps. Because of that, many populations of C. sowerbyi will be all male or all female. So the next time you’re near a calm, freshwater environment in Colorado (or almost anywhere else), take a closer look underneath the surface. You might just see a jelly. In response to Katie’s post on funny fossil names, here are some more memorable scientific names. Sir Arthur Conan Doyle, Elvis, and Ichabod Crane are only the tip (fictional or not) of the naming-new-species-after-people iceberg. The host of Comedy Central’s The Colbert Report, Stephen Colbert, has a species of trap door spider named after him in the form of Aptostichus stephencolberti. As in the host’s last name, the “T” is silent. The spider was named by East Carolina University biologist, Jason Bond; who has also bestowed similar honors on musician Neil Young, South African leader Nelson Mandela, and actress Angelina Jolie. Colbert also has a diving beetle, Agaporomorphus colberti, and a stonefly, Diamphipnoa colberti, named in his honor. Having three species named after you is pretty impressive, but the king of scientific naming may be Far Side cartoonist, Gary Larson. Larson has not one, but three different species named after him including Strigiphilus garylarsoni, a genus of biting louse found only on owls, Serratoterga larsoni, a variety of butterfly found in the rainforests of Ecuador, and a beetle species known as Garylarsonus. Additionally, there is Larson’s Syndrome, a psychological condition in which a person has either a lack of awareness or acceptance of their impending doom. Gary Larson also coined the term “Thagomizer” in one of his cartoons in reference to the spiky bit found at the end of dinosaur tails, such as that of a Stegosaurus, due to its negative effects on caveman, Thag Simmons. The term is now accepted by paleontologists as an official, albeit whimsical, part of dinosaur anatomy. During our latest heat wave, I decided to watch documentaries about places much hotter than Colorado, in the hopes of feeling better about my own temperature predicament. One film, Shifting Sands: The Story of Bedouin Women at the Crossroads, was fascinating, but left me with a nagging question in the back of my mind. Why do cultures like the Bedouin and Tuareg, peoples who live in the extreme heat of the desert, wear black robes? I’d always been told to wear light colors when it’s hot since dark colors absorb more heat, and robes are what I wear when I’m cold, not what I’d imagine putting on in the middle of the desert. I did a little research and, as it always does, physics provided me with an answer. It turns out that when deciding whether or not clothing will keep you cool, you need to consider absorption and convection. 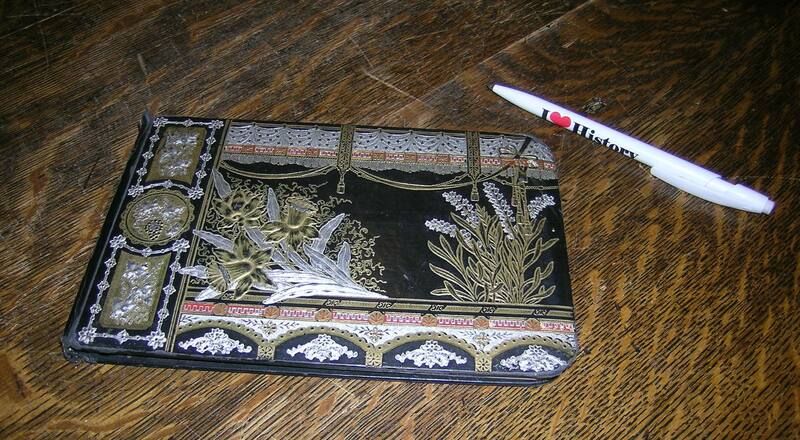 It’s true that dark-colored clothing absorbs heat and light-colored clothing reflects it. But, light-colored clothing won’t always make you feel cooler. You see, while light-colored clothing reflects external (coming onto your body) heat away from your body, it also reflects internal (coming off of your body) heat back onto your body. Dark-colored clothing absorbs external heat, but it also absorbs internal heat, wicking away the heat that your own body is emitting. Combine that information with the fact that even a slight breeze blowing over dark-colored clothing will convect the heat away from the cloth faster than it’s being absorbed, and sometimes you can be cooler wearing dark colors than you are wearing light colors. So, black robes can be cooler than white robes, but it still seems like it would be hot wearing a robe. Well, it turns out it’s all in how you wear it. Unlike the way I bundle myself up in my flannel robe, Bedouin robes are loose. Loose robes means that air can circulate within them. Since warm air rises and is replaced by cooler air, wearing a loose robe means that the movement of warm air out of your robe brings cooler air in, similar to how a chimney works. So the next time you know you’re going to be out in the heat, try wearing loose, dark clothing. Not only will you look cool, you might feel cool, too. 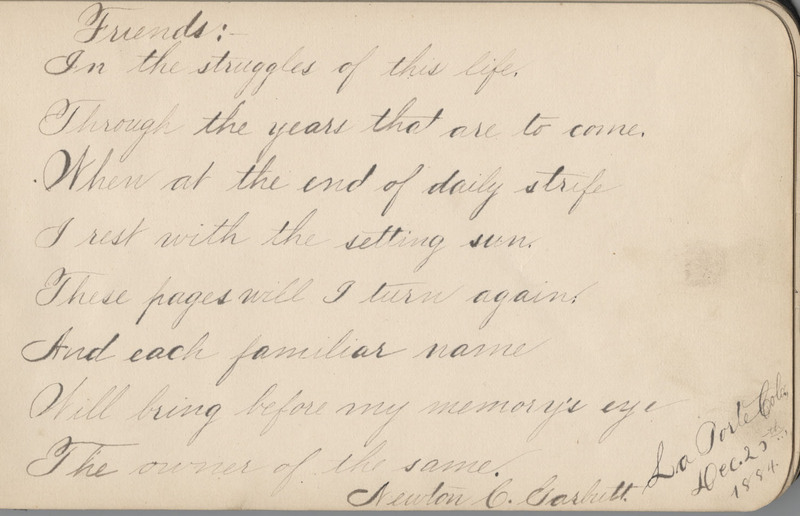 This lovely autograph book belonged to Newton Garbutt of Laporte, Colorado, and from 1884 to 1890 he collected within its pages eloquent signatures, sayings, and words of advice from his friends in Laporte, Fort Collins, and Timnath. 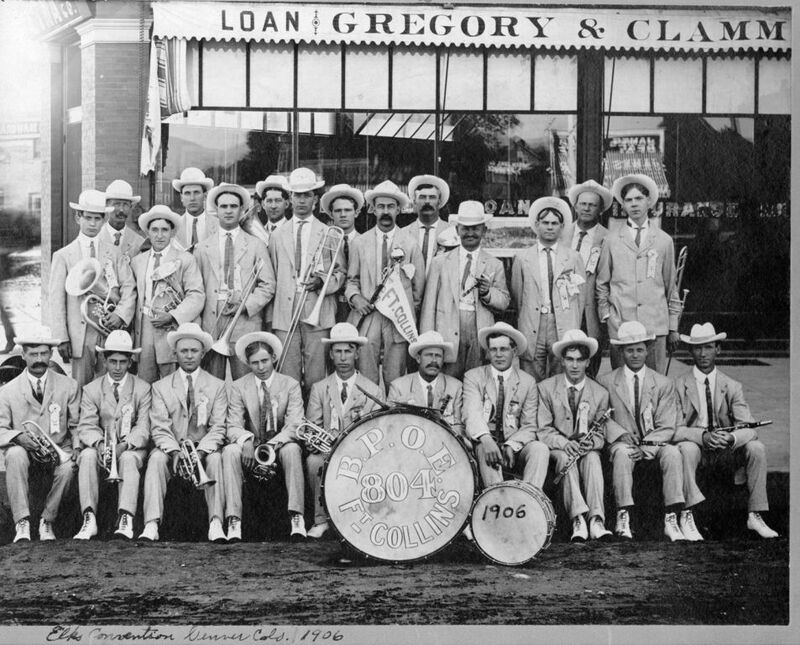 Newton Garbutt with Elks Club Band, 1906. He is the last man seated on the far right. 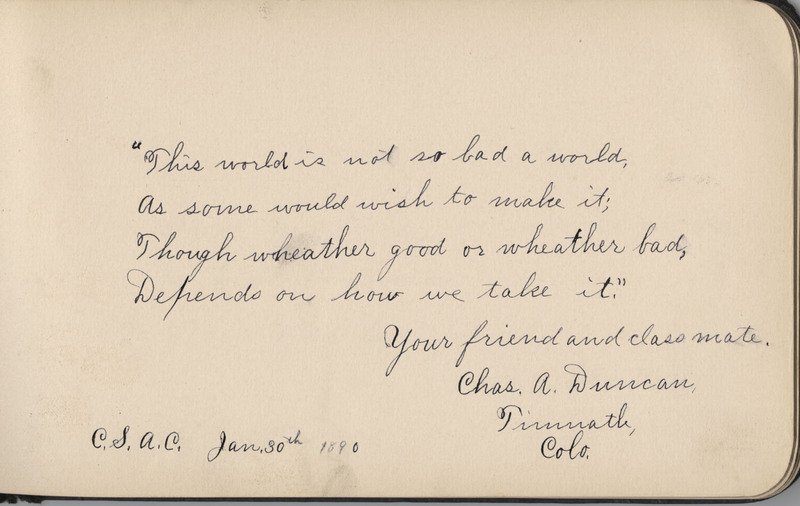 Now, I don’t want to offend my fine pals who signed my high school yearbooks (UR 2-Sweet 2B 4-Gotten), but you guys have nothing on the friends of Newton Garbutt! They named that fossil what? Meet the newest of the frill-crested herbivores: Mojoceratops. Discovered in the Dinosaur Park Formation of Alberta and Saskatchewan, Canada, the skull of Mojoceratops is making headlines for two reasons. First, the heart-shaped frill on this dinosaur makes its head adornment one of the largest and most interesting looking of the ceratopsians. Second, the dinosaur’s name, “Mojoceratops,” started out as a joke suggestion after the paleontologists brainstorming what to name it had a few beers. Joke name or not, it was catchy, it stuck, and now that the name has been formally published, it’s here for good. There are strict rules for name new organisms, all governed by the International Commission on Zoological Nomenclature. The scientific names we use today (e.g. humans are Homo sapiens) was developed by Carl Linneaus, and the rule is that the person (or persons) who discover the new organism get to do the naming. There are many different ways to chose a new organism’s name: describing an unusual feature of their appearance, naming the location where the organism was found, or naming it to honor another person are all common. Another common trend in naming? Scientists using the opportunity as a chance to be funny. That’s how the world got the snake genus Montypythonus, or the clam species Abra cadabra. Paleontologists aren’t immune from wanting to inject a little humor into their discoveries, so in honor of Mojoceratops, here are some other fossil names that will give you a chuckle (or at least make you go, “huh?”). Aegrotocatellus jaggeri – a trilobite named after Mick Jagger (and, oddly enough, Aegrotocatellus means “sick puppy” in Latin. Go ahead and figure that one out). Avalanchurus lennoni, A. starri, A. simoni, A. garfunkeli – more trilobites, named after John Lennon, Ringo Starr, Paul Simon and Art Garfunkel. What about Paul McCartney and George Harrison? Elivisaurus – Sadly, this name is no longer official (and Cryolophosaurus just doesn’t have the same ring to it). But, for a time this crested dinosaur, the first discovered in Antarctica, shared a name (and a similar hairdo) with the King of Rock. Arthurdactylus conan-doylensis – a pterodactyl named for Sir Arthur Conan Doyle, who wrote The Lost World, a book about a hidden plateau in South America where dinosaurs still lived. Ichabodcraniosaurus – this velociraptor-like dinosaur skeleton was found without its head, and named in homage to The Legend of Sleepy Hollow. In the story, the protagonist, Ichabod Crane, was chased by the Headless Horseman. I don’t think I’d have wanted to be chased by this dinosaur, either, headless or not. Mimatuta morgoth, Alletodon mellon, Mithrandir sp., Oxyprimus galadrielae, Protungulatum gorgun – The paleontologist who named these prehistoric mammals like J.R.R. Tolkien’s The Lord of the Rings series. A lot. Look at the scientific names and you’ll find: “Morgorth” – the Dark Lord, “mellon” – Elvish for “friend” and the password to enter the mines of Moria, “Mithrandir” – another name for the wizard Gandalf, “galadrielae” – the elf Lady Galadriel, and “gorgun” – the Orcs. Gojirasaurus – Another dinosaur from the late Triassic period, named after another fearsome lizard. “Gojira” is the Japanese name for Godzilla. Technosaurus – Technically, this dinosaur is named after Texas Tech University. But I prefer to think it’s because the fossil was found with a glowstick in its claws. What about the rest of you – know any fun and/or interesting dinosaur names?